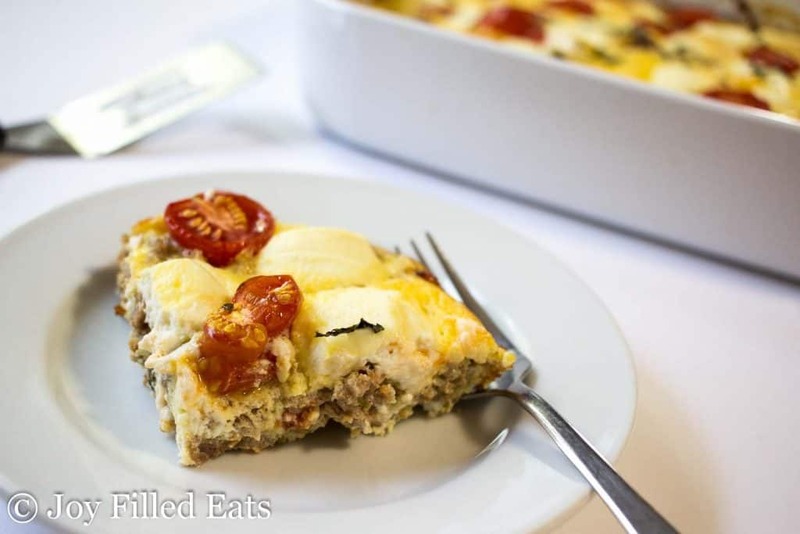 My Ricotta & Sausage Breakfast Casserole is very easy to put together with 6 ingredients but impressive enough to wow your family and friends. 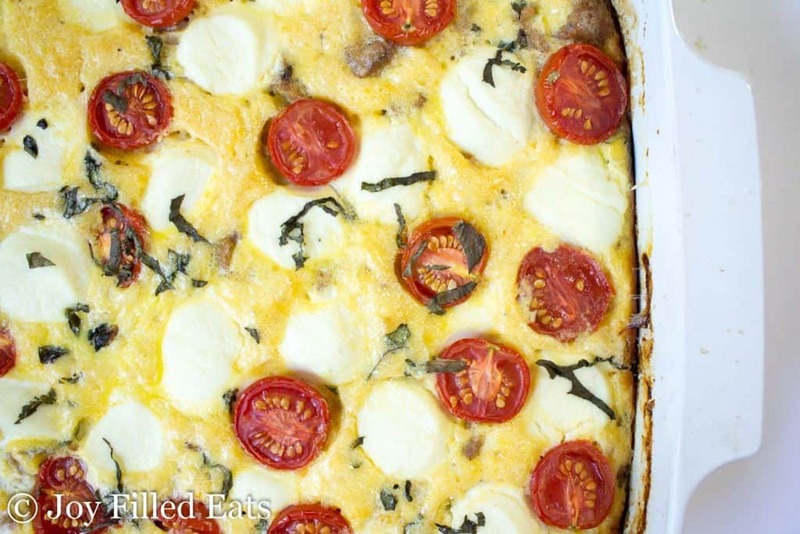 With fresh tomatoes, basil, ricotta cheese, and sausage it is flavorful and delicious. It’s not often that I impress my husband with my cooking anymore. I think he’s gotten rather spoiled since I have to make so many yummy things for my blog. He’s used to fresh, home cooked meals almost every night of the week. 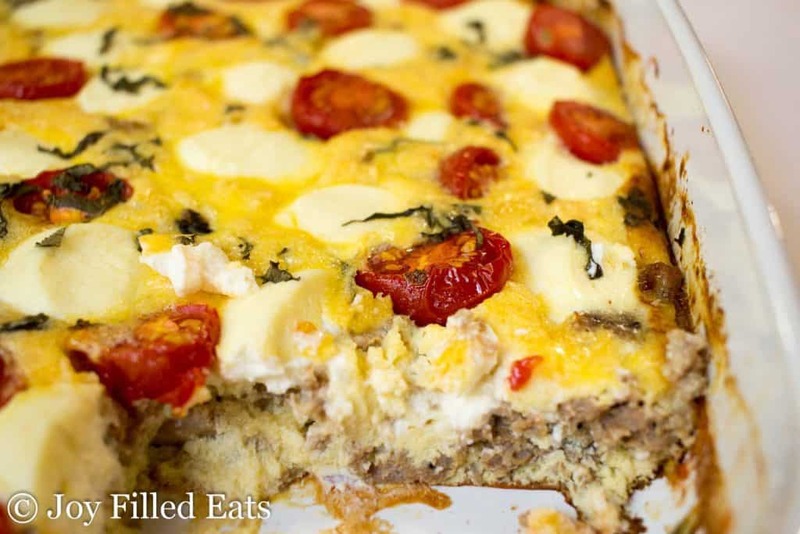 But this breakfast casserole even impressed him. He said, “That looks really cool.” And then at dinner, “Taryn, this is really good.” Which is a big step above the standard, “Thanks honey for a nice dinner,” that I usually get whether he likes it or not. This really can be a meal in itself but since we were having breakfast for dinner last Friday I let my 8 year old make some pancakes too. Add in some fresh fruit and we had a wonderful meal. One of my least favorite chores is washing dishes. I try to simplify the cooking process to eliminate extra dirty pots and pans. Sometimes it works, sometimes it doesn’t. Pre-cooking the sausage in the casserole dish and then draining it and crumbling it worked really well. 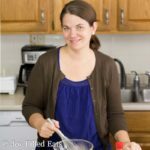 Whisking ten eggs in a bowl they barely fit in? Not so much. 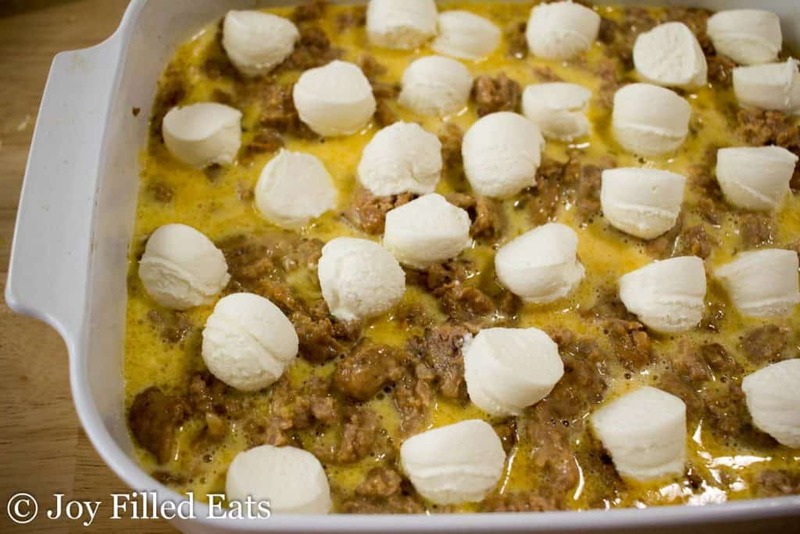 I used a small one tablespoon cookie scoop to drop the balls of ricotta on top of the casserole. You could use a teaspoon if you don’t have a cookie scoop but I recommend getting one. That is one of my favorite kitchen gadgets. I have three different sizes and use them all frequently. 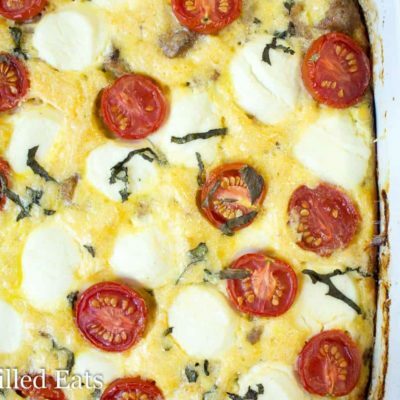 I hope you enjoy this Ricotta & Sausage Breakfast Casserole as much as we did! 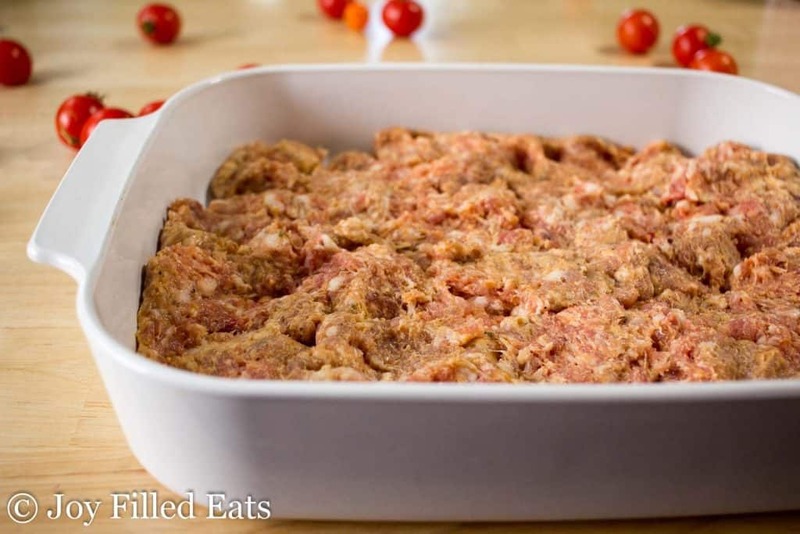 Put sausage in the bottom of a large casserole dish. Bake for 20 minutes. Remove from the oven and carefully drain. I drained over a cup of oil and cooking liquid. 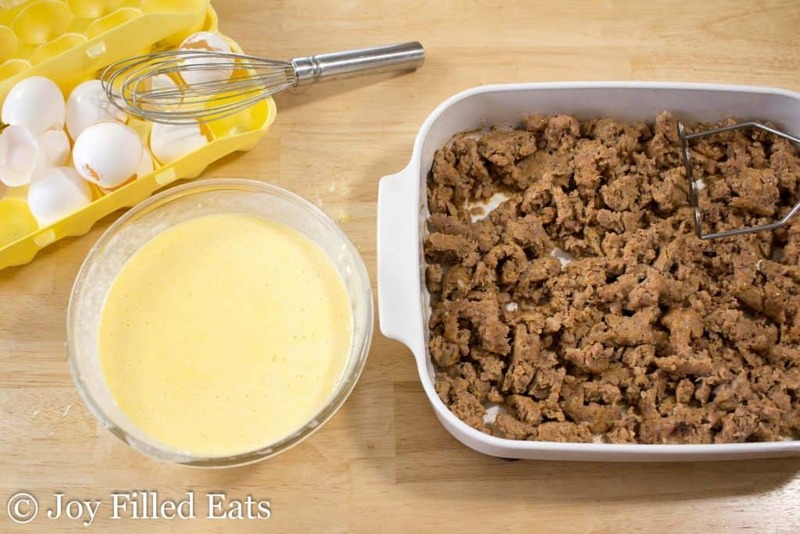 Break the sausage up into small pieces using a potato masher. Blend the eggs and cream cheese until smooth. Pour over the cooked, drained sausage. Sprinkle with 1/2 tsp salt. 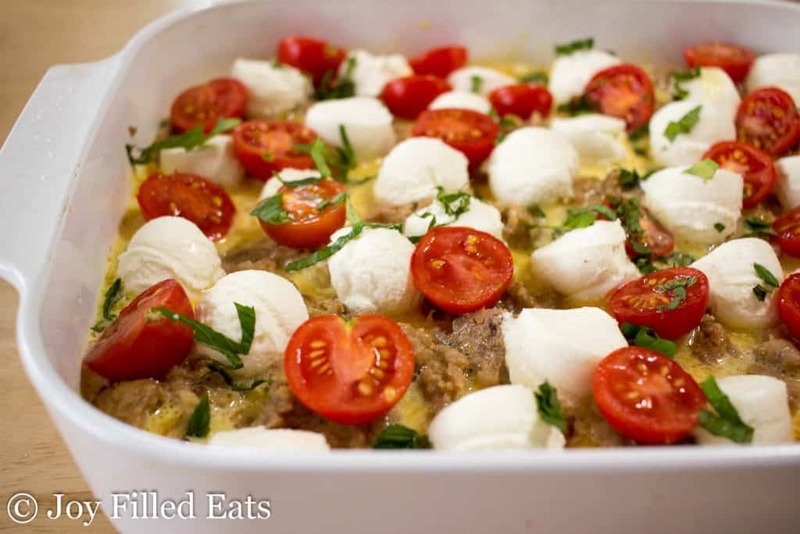 Put blobs of ricotta on top. Distribute the tomatoes evenly. Sprinkle with the chopped basil and remaining 1/2 tsp salt. Bake for an additional 35-40 minutes until the eggs have set. Hello, I'm wondering if I can prep this the night before and put it in the fridge? thanks! This looks wonderful! Have you ever tried freezing it? Thank you for sharing! No, I don't think this would freeze well. I'm sure it would still be edible but the texture of the ricotta might be off after thawing. Your recipe shows 415 calories but dies not show serving size. What is serving size? It sounds so good. It says it near the top of the recipe card, there are 12 servings. This was delicious! I will be making this again for sure. The only thing I would change is to add a few more eggs. There was too much sausage for the amount of egg. Thanks! I never leave comments on blog recipes I try, but this one is an exception. This was SO easy and delicious! I followed the recipe as-is, the only difference being I cooked the sausage in a skillet on the stove instead of in the oven (only because I totally missed the part of the recipe that said I should cook it in the oven :P) Will definitely be making again! This was fantastic! Thank you so much for making my breakfasts better. Delicious! And I used dried basil and forgot to add the tomatoes 🙁 so I can’t even imagine how much better it will be next time. I tried this recipe because I had ricotta that needed to be used. So good! This looks really good! When you say "large casserole dish", do you mean 9x13"? Mine is bigger than that. I think it's 11 x 14. But any large casserole would work.